Potato leafhopper (Emposaca fabae, PLH) is native to eastern North America and is found on apple, pear, grape, potato, strawberry, soybean, alfalfa, and many other field crops, as well as some forest trees. 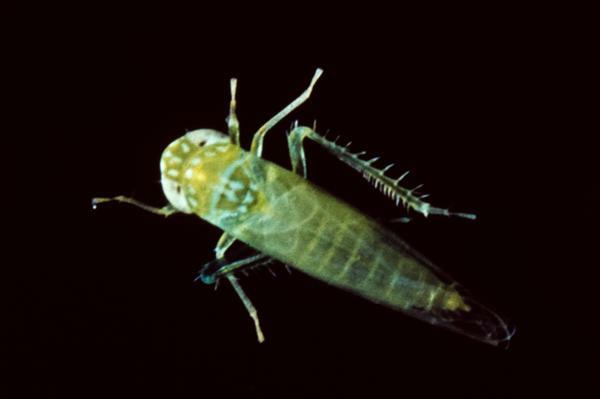 PLH nymphs are tiny, whitish green, and wingless. Adults are greenish white, 1/3 inch (8mm) long, and have a wedge shape when viewed from above. Unlike white apple leafhoppers, which only move forward and backward, PLH move sideways in a characteristic crablike fashion. When disturbed, nymphs move quickly to the backsides of leaves and adults fly away. Eggs are about 1/25 inch (1mm) long, creamy-white, and cylindrical. 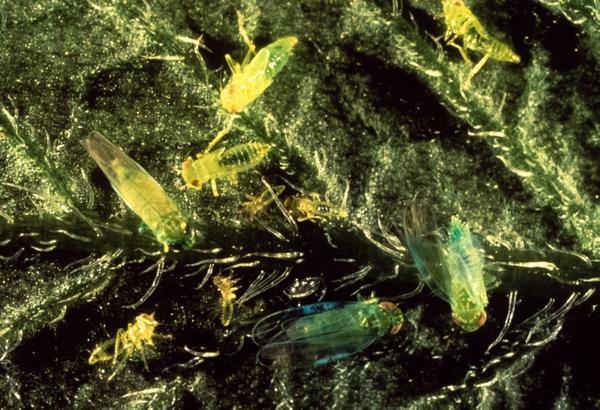 Potato leafhopper nymphs and adults. PLH do not survive in North Carolina year round. After overwintering in the Gulf states, adults migrate northward each year, usually reaching the southern Appalachians by early summer. Mated females lay eggs on the bottoms of leaves inside veins. Eggs hatch after about 10 days, and during the next two weeks nymphs will pass through five instars, become winged adults, and mate, producing the next generation of eggs. 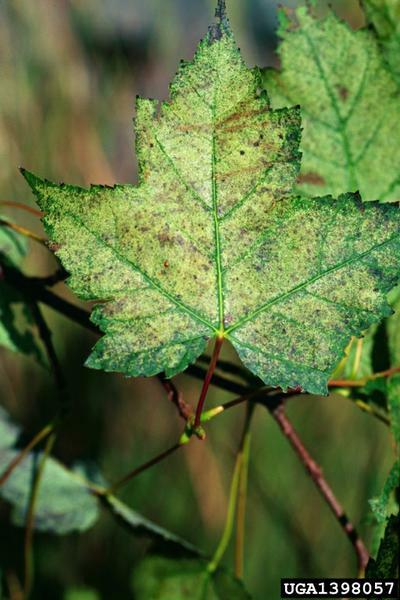 In North Carolina, there are usually three or four generations before the insects are killed by frost. 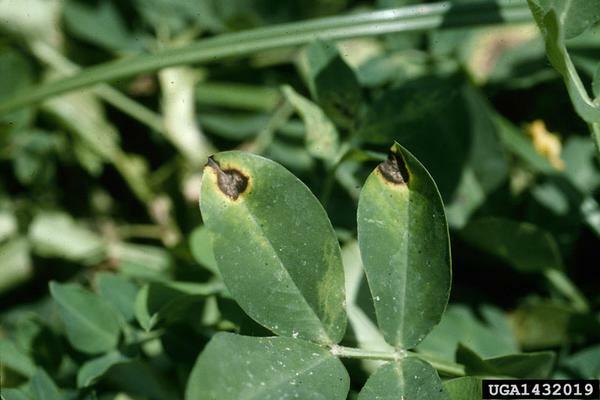 Both adults and nymphs feed on leaf tissue on new shoots, causing stunting, curling, and a browning disease resulting from toxins PLH inject into the plant. These symptoms are commonly referred to as "hopperburn," but mature trees are not usually affected to the point of economic significance. PLH damage on potato (left). Leafhopper damage on red maple. 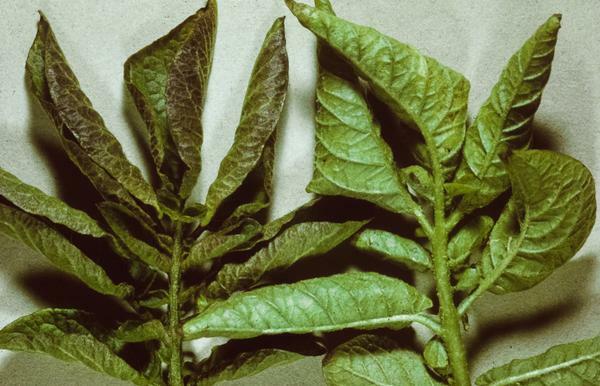 On new or high-density plantings the feeding can be damaging, but a wide range of insecticides have activity against PLH, especially in the early-instar stages. It is important to apply insecticides frequently in order to maintain their effectiveness on new, growing tissue. Many natural enemies attack PLH, but they are often insufficient for commercial operations.